Browse our selection of beautifully designed Wisconsin gift baskets by choosing a gift basket category that's fitting for the occasion. With our simple online gift basket ordering system, it's easier than ever to send gift baskets to Wisconsin and to loved ones nationwide. From scrumptious cookie baskets to smooth-tasting chocolate gift baskets there's a perfect gift basket for everyone at Adorable Gift Baskets. Wisconsin Gift baskets themes include such occasions as Christmas, birthday, get well, new baby, thank you, sympathy, housewarming, corporate and personal events. Gift baskets can contain gifts such as gourmet food, fruit, coffee, tea, chocolates, snacks, cookies. In these busy times, you can get side-tracked from remembering important gift giving dates in a hurry - such as your mom's birthday or your favorite aunt and uncle's 25th wedding anniversary. Perhaps you've allowed an important meeting with a client to slip up on you. You still have the time to order a professional corporate gift basket from Adorable Gift Baskets. Do you feel rushed to find a last minute gift basket? Don't worry, Adorable Gift Baskets makes it easy and affordable to buy amazing gift baskets designed for any gift giving occasion. Even holiday gift basket shopping will be much less hectic when you opt to have elegant holiday gift baskets delivered to your friends, clients and loved ones. With our huge selection of Christmas gift baskets you'll be able to choose from hundreds of gift items - for the old or young, male or female - we have gift basket choices for everyone on your gift list and all your gift needs. When trying to impress a client, your business gift basket choice can make all the difference. That's why Adorable Gift Baskets offers the most exquisite corporate gift baskets delivered to clients in a timely, professional fashion. Our business gift baskets feature fine gourmet foods...everything from gourmet meat and cheese to salty pretzels, fresh baked cookies and decadent chocolate gift baskets. For the executive that loves golfing, try our golf gift baskets designed specifically for the golf enthusiast. Our sports gift baskets include creative gift items such as golf-themed snack packages, tees, golf balls, etc. Or, for the avid coffee drinker, have one of our Starbucks gourmet coffee gift baskets delivered to their home or office. Even if you need to provide food treats for an entire office staff, you can easily opt for one or more of our large corporate gift baskets overflowing with food and gourmet snacks for everyone to enjoy. Origin of Wisconsin State Name: Based on an Indian word "Ouisconsin"
Highest Point in Wisconsin: Timms Hill, 1,951 ft.
Lowest Point in Wisconsin: Lake Michigan, 581 ft.
No matter what the gift giving occasion or need, you'll be amazed at how easy it is to send upscale, professionally designed gift baskets to your recipients. 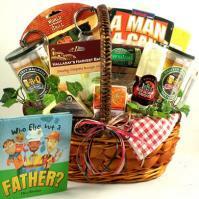 Browse our many categories of baskets to find that perfect gift basket for your friend or client. Make a difference in someones life with a kind gesture - our creative gift basket delivery service gives you access to a world of affordable gift basket choices.